The app was first teased way back in 2017 at the New York Comic Con, with only a still image showing off what might be coming to the platform. Since then, there's been little in the way of visuals that would hint at what the app might look like, so chatter about the app among Magic Leap followers seemed to die down a bit, as few knew what to expect. As it turns out, the MadeFire app for Magic Leap is much like the tablet version of the app, just transported into the world of augmented reality. To showcase the app to new users, Madefire enlisted the talents of Watchmen artist Dave Gibbons, who walks viewers through a brief demo (see video below) of how comics are created and read via the Magic Leap One app. 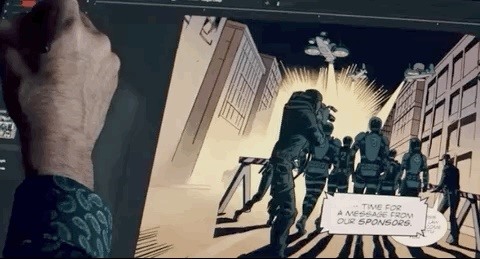 If you're already a fan of the Madefire app on the iPad, then using the Magic Leap version will be a simple "leap," as the comic book panels spring to life in much the same way, except you can now place them in your real-world surroundings, as well as resize and anchor them. For a longtime comic book reader like myself, the experience of being able to walk through and behind a comic panel is a brand new experience and something I've always imagined doing. Part of how the app accomplishes this is by allowing the comics to present 2D panels in layers that are distinct from one another. So while the comics aren't 3D virtual objects, the layered 2D virtual panels go a long way toward delivering a different kind of immersive experience. The experience of being able to actually walk through and behind a comic panel is a brand new experience, and something I've always imagined doing. The other treat is that Madefire's Motion Books stories are also available in AR, with 12 available at launch. For the uninitiated, on Madefire, Motion Books are comic books that come with added audio and animation components. But the animated components aren't "true" animation that you'd find in a cartoon. Instead, elements of each panel are moved within the page or frame to add dramatic effect. The closest comparison I can think of is to the 2D still animations of Flash popularized years ago by web ads and mirrored (in effect, but not via Flash) in the popular show South Park. I'm not sure if I'm a fan of Motion Books on a tablet, but it's a completely new way of reading comics that is particularly unique when viewed via the Magic Leap One. An unexpected aspect of the Madefire app on the Magic Leap One is the ability to produce comic books as well. The Madefire team walked me through a session of creating a short Motion Book comic on the app while wearing the AR headset, and the process seemed fairly easy. In some ways, it felt a bit like a spatial computing version of Photoshop but geared toward comic book creation, and requiring no coding experience from the user to get their work into AR. Anyone looking to begin creating their own augmented reality comic books for the Magic Leap One on the Madefire app can visit the company's site and sign up for author access. But now for the most important question: Will I be reading a lot of comic books this way? That's hard to say, since I now favor graphic novels (also available in the Madefire app) over comics, and I particularly enjoy reading and viewing those works in print as art pieces. Because of this, I've never completely bought into the digital comics apps from the likes of ComiXology and others. But like digital comics apps, I'm willing to give this new approach a try. The app is free to download immediately for Magic Leap One users, with a range of comic book titles available for free download at launch.